TESVOLT specializes in commercial battery storage systems. The innovative company from Lutherstadt Wittenberg/ Germany produces storage systems with state-of-the-art prismatic lithium battery cells from Samsung SDI, based on nickel manganese cobalt oxide. 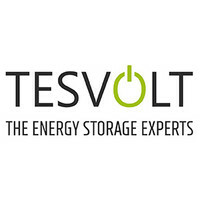 TESVOLT storage systems function just as well at low voltage as at high voltage, and can be connected to all energy producers: sun, wind, water, biogas and combined heat and power – on-grid and off-grid. All storage systems are produced at TESVOLT’s manufacturing facility in Germany. The company was founded with the ambition to continue to drive the renewable energy sector forward. The company’s co-founders, Daniel Hannemann and Simon Schandert, have been working in the photovoltaic sector for many years, so they have excellent knowledge of the market and innovations in the renewables industry. They have named TESVOLT after battery inventors Nikola Tesla and Alessandro Volta.